There is a backpacking program offered for youth groups including Boy Scouts, Venturers, Explorers and others in the 13 and up age bracket. The Little Brave Program is specifically designed for younger groups. The CPP also hosts events each year that are designed to support the youth programs as well as providing a training session called "Lookout Training" for adults interested in learning more about how to use this exciting program to enhance their group's activities. It should be noted that these programs, while originally designed for members of the Boy Scouts of America are open and available to other youth groups such as home schoolers, Girl Scouts USA, Guides, Pathfinders, etc. 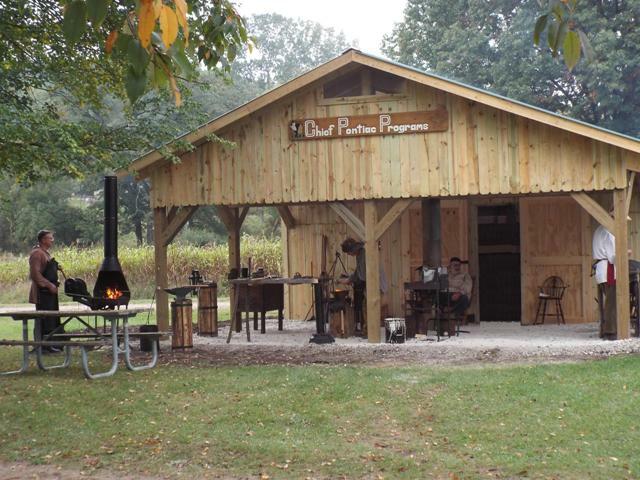 Hands on Blacksmithing, Woodworking, Life Skills (such as Fire Starting by Flint and steel, Rope making and splicing and more), Bead work, Weaving and Spinning and fiber arts, and Outdoor Cooking classes and more are being offered at our new training center. 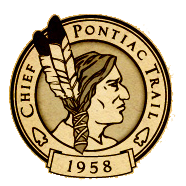 Chief Pontiac Programs operates Kensington Living History Village in partnership with the Huron Clinton Metroparks. Located at the Farm Center, in Kensington Metropark in Milford, Michigan. Early American Skills Experience Schedule to see when this exciting program is offered. The Chief Pontiac Programs Committee will continuing to develop the Early American Skills Experience, at Kensington Living History Village. We are committed to continue creating unique living history themed educational programs for youth and adults. The FORT Pontiac Challenge patch program, for youth and adults, is once again being offered, at the new facility. The CPP Committee also supports some of the Kensington Metropark Farm Center Activities by demonstrating Early American Skills in the Village. Check the Early American Skills Experience Schedule. Please send your questions or comments about the our programs to info@chiefpontiacprograms.org. CPPC Programs are conducted in public park systems. Vehicle passes may be required for entry and are not included in any CPPC fees.